We are twinning in Folter's Faces dress! Both of us seem to have a deep love for Folter & Retrolicious dresses (sister companies) so I'm thrilled to be twinning with another big fan of arguably my most worn dress brand! This post is a little bit different because as I mentioned above, Penelope Pinup does an amazing (and hilarious) job of photoshopping herself into silly scenes. I wanted to keep the integrity of some of the impressive wide shots she made so only a few of our photos are going to be presented in a collage format. Honestly, I was tempted to make this whole post a showcase to her handiwork, but I figured I may as well stick with the Twinsie Tuesday theme and just alter the format slightly! So without further ado, here is our post! Penelope Pinup: I love red with black and white. Also since this dress is a little short on me, I wanted to wear a "high" heel with it to accentuate that instead of hide from it. And since I almost always wear flats, I have limited choices for heels! And yes, that's a high heel for me! Lauren-Blair: Initially I was going to wear my zebra platforms to mix prints but keep the same color scheme. (Below you can see Penelope Pinup had a similar idea with her zebra photoshop!) I've been a little behind on taking outfit photos and (gasp) only took my pictures yesterday! As you may or may not have heard, ha, that little eclipse thing was yesterday. Prior to taking photos I wore this and walked around my neighborhood while the celestial event was happening so I randomly threw on flip-flops. I liked how the lavender looked with the black and white and knew they matched my Kate Spade triceratops bag so I decided to go with this more casual summer look instead! And then I added my Erstwilder dinosaur brooch because the colors matched...without even realizing the dinosaur motif! Whoops! Penelope Pinup: I love Retrolicious and own probably ten or more dresses by them. I'm a super fan of a quirky prints and they really do quirky well. I also love that they offer plus sizes in almost every print they release. Sadly, that's a major feat. 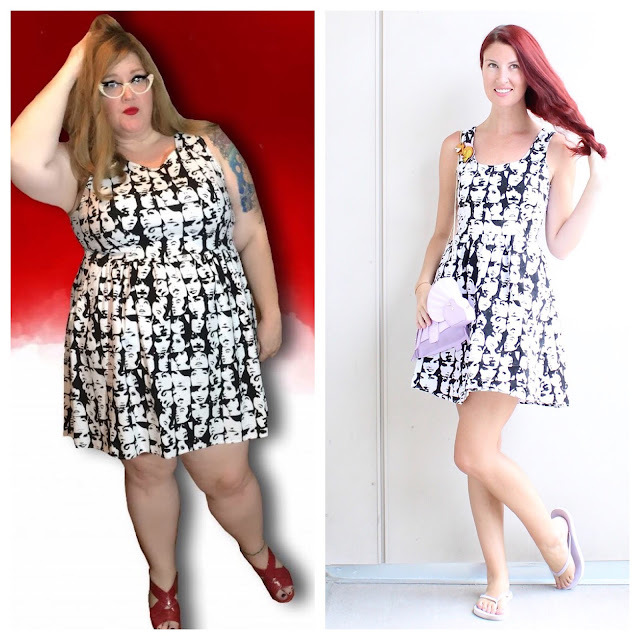 Lauren-Blair: All of the time, especially in the summer since Retrolicious/Folter dresses tend to be shorter than my other novelty print dresses. I do pair them with boots and layers a lot throughout the year as well. Penelope Pinup: I don't wear this particular print as often as some other Retrolicious dresses because it is a little short on me. I tend to wear it more in the winter when I can pair it with colored tights or leggings. 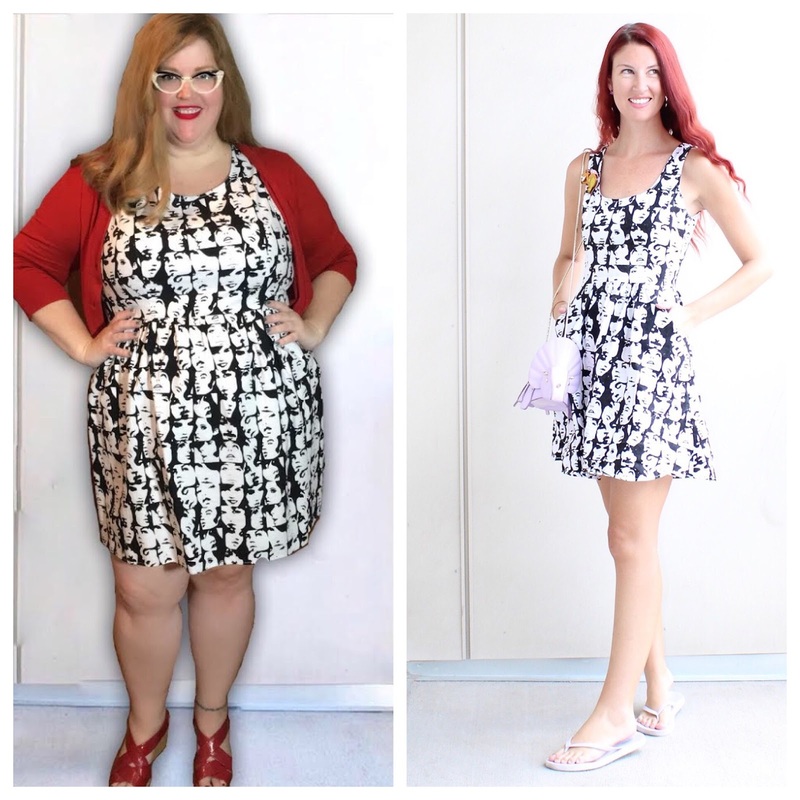 Lauren-Blair: Not as often as my other dresses from the same brand. I'm very attracted to color, so I gravitate towards the brighter prints more. This print is just too cool though and I should wear it more often! Penelope Pinup: I love the black and white mod feel of the print. I call it my "Beatles" dress because something about it reminds me of their early years vibe. Hence, my Beatles photoshop. Lauren-Blair: Last year I went through a kick where I got super into prints with faces on them, though (weirdly) I'm not sure I've photographed most of my finds for the blog or IG just yet. Knowing I love and trust this brand acquiring this face print dress from them was a no brainer. Penelope Pinup: Like I said above, I love to wear this dress with colored tights. And because its black and white, I can pair it with any color and really change the feel of it. Lauren-Blair: I'm like the one person on the planet who struggles with black and white motifs. It's literally the easiest and most 101 styling option available but my mind goes blank. I think I've mostly worn this as you are seeing it now, just casually with flip flops (of different colors). I don't think I've ever "done up" this dress is a big way. I LOVE that you photoshop yourself into silly backgrounds based on the theme of your outfits. What made you decide to do this and is it as much fun as it looks? Penelope Pinup: Thanks! I'd like to say that I had some sort of big artistic revelation but really I started doing it because my bedroom (where I take my ootd photo) is usually a mess and I wanted something to hide it! Then an artistic friend with an impressive Instagram following gave me some branding advice and was like "this is your aesthetic- you need to run with it". So, I did! I actually really like that portion of the ootd the best! I find myself thinking about what I'm going to wear the night before and trying to figure out what background will match. It's become a bit of a creative outlet for me! You share outfits on Instagram, but so far do not have a blog. What inspired you to share #ootd pictures on Instagram and do you think you'll ever start blogging? Why or why not? Penelope Pinup: My boss actually suggested that I start instagramming my outfits! Every morning she'd ask me to stand up so she could see what I was wearing and she thought other people would be interested as well. I thought that since I enjoyed looking at other people's ootds and seeing where they bought their pieces, that maybe someone would like to see mine. 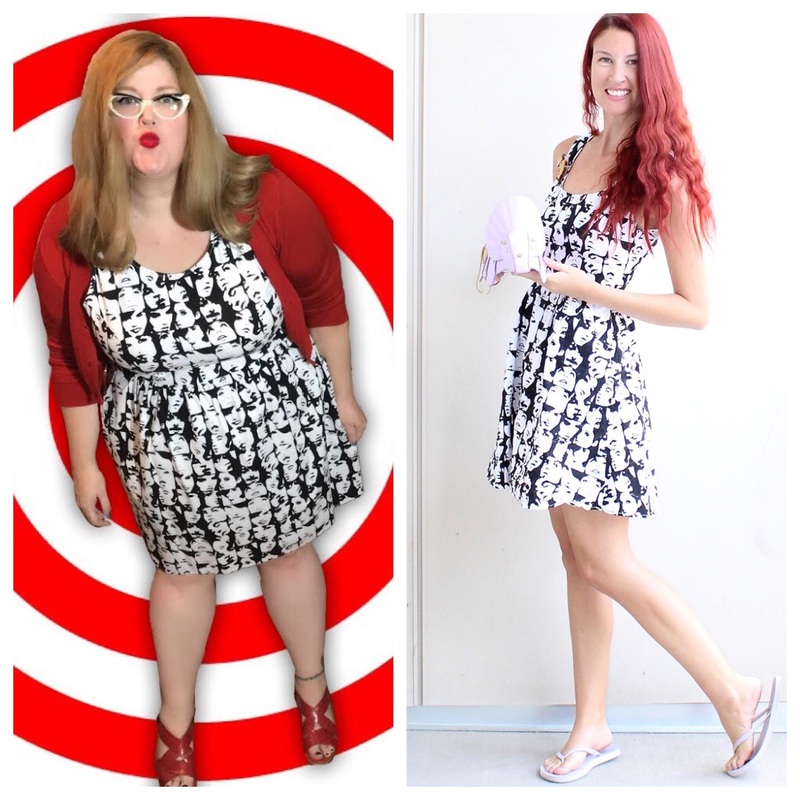 Especially since it's often hard to find cute, on trend or pinup clothes in plus sizes. I thought I could pass along the companies I've had success with to other gals. I would like to start a blog but I'm having trouble with the technical side of it. I think I'm going to try another platform and give it another whirl. I enjoy writing and have been told on numerous occasions that I need to write a book, so maybe a blog would be a good start! Well, I would DEFINITELY follow any future blog or related project that she does! To follow her, click @penelopepinup and enjoy what colorful photo idea she'll come up with next! Have a great Tuesday everyone!